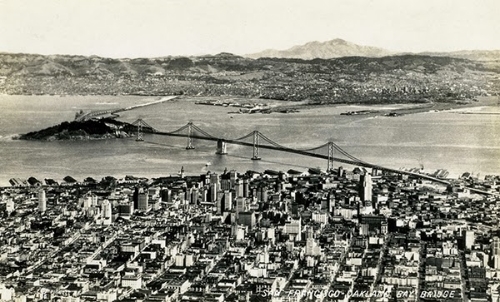 The San Francisco-Oakland Bay Bridge opened in November 1936. Some of the earliest photographs of the bridge were taken in 1936 by James Kenneth Piggott, a commercial photographer who made his living, in part, as a printer and publisher of postcards. 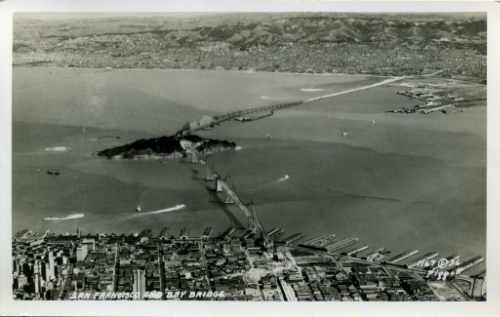 Three of these 1936 bridge photographs, which probably were published as postcards, are below. It turns out that Piggott, who died in 1941, was born — in tiny Bodega Corners, Calif., in Sonoma County — in 1859, the same year that Joshua Abraham Norton declared himself "Norton I, Emperor of the United States." Did Piggott ever have occasion, as a boy or young man, to meet the Emperor? Certainly, he would have known about him. To learn more about Piggott, read the excellent biographical profile in the October 2012 newsletter of the San Francisco Bay Area Postcard Club.